Learning never stops for many people, even after you’ve completed high school and graduated from university. Besides the usual vocational training that includes specific courses, MOOCs (massive open online courses) have been rising in popularity from the likes of Coursera and edX. They’ve provided people with access to any university’s educational catalog, representing some of the finest institutions from across the world. However, there hasn’t been any contribution from the Middle East region. 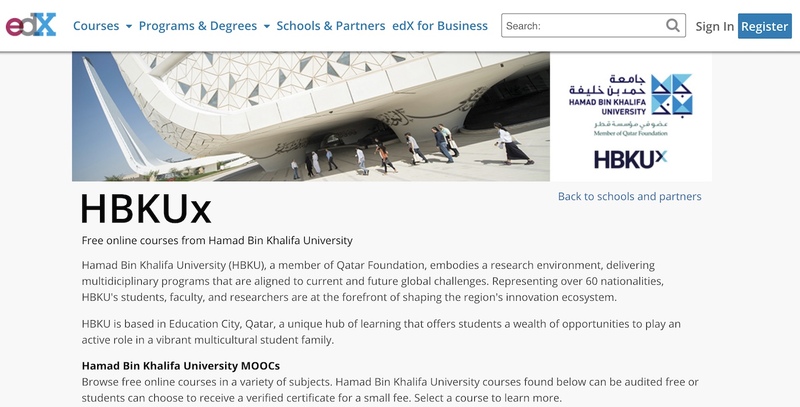 That’s about to significantly change with the recent partnership between HBKU (Hamad bin Khalifa University) and edX. The nonprofit online learning platform founded by Harvard and MIT will soon see interdisciplinary courses from Qatar Foundation’s HBKU being offered to millions of students worldwide. The former becomes the first in the Middle East region to provide interdisciplinary courses through the online edX platform. The official dedicated HBKUx page of the edX website is already live, and the first course already being offered is ‘Solar Energy in Hot Desert Climates‘. Two more MOOCs – ‘Solar Resource Assessment in Desert Climates’ and ‘Using Photovoltaic Technology in Desert Climates’ – will be offered as part of the HBKU Professional Certificate program starting from Q1 2019.